I entered medical school, specialised in Obstetrics and Gynaecology and did full time research on pregnancy haemorrhages. My interest in childbirth-related mortalities did not wane, but I did not get real answers to my question. Then I became a Rotarian. I wanted to utilise my hands-on vocational efforts for service, but the opportunities at that time were limited. In the 1990s, global organisations like the U.N. challenged the world to address this question in the form of Millennium Development Goals. Global organisations and governments put a lot of funding towards improving hospital facilities and started promoting institutional childbirth deliveries but progress remained slow. Two events in 2010 helped me find an answer to my question. First, my district, 1120 (England), became part of the Future Vision pilot. This opened the door for service through hands-on vocational efforts and advocacy through a global grant-sponsored Vocational Training Team. Second, I had the good fortune to chair an international collaborators meeting on maternal mortality in Delhi focused on why mothers die in low resource settings. The combined results were fantastic. The concept of Calmed (Collaborative action in lowering maternity encountered deaths) developed during the next three years with the help of important collaborators including FIGO (The International Federation of Gynecology and Obstetrics), GLOWM (Global Library of Women’s Medicine) and MAF (Medical Aid Films), Laerdal, Department of Health and Family Welfare, National Health Mission and of course our own Rotarian Doctors Fellowship and Rotarian Action Group on Population Development. India remained our challenge. In spite of massive efforts by the Indian government, maternal mortality reduction in India was slow. Still today, the lifetime risk of a woman dying at child birth is 40 times higher in India than in the UK. India has the highest annual number of maternal deaths (about 55,000). Ironically, most are preventable. TRF-sponsored Vocational Training Teams played leading roles in implementing the Calmed model. 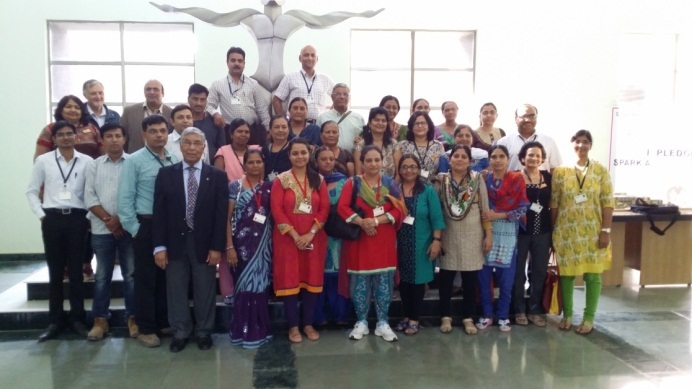 Using hands-on approaches, modern technology and a “train the trainer” model in two states in India, the team led skills trainings in managing emergencies at childbirth and raising awareness of childbirth related issues in the villages and urban communities. Monitoring and evaluation is an important component of the Calmed programme. 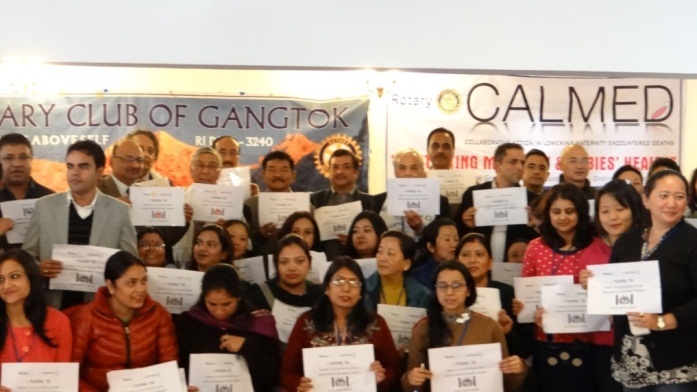 In Sikkim, India, where the programme was first introduced in 2013, our vocational training team of six doctors from the UK trained 13 local Ob Gyn staff members who became master trainers after stringent pre- and post-test assessments. The local master trainers have since trained over 200 doctors, midwives and health activists in the practical management of emergencies at child birth. Following the introduction of Calmed, the maternal mortality ratio was halved in just over 12 months. Invitations from the government and local Rotary clubs led to a second vocational training team to visit Gujarat in 2014 and train 26 master trainers. More than 40 doctors and midwives were then trained and the training cascade continues with outstanding results. As we move forward, we are planning to take a team this year to Madhya Pradesh, India, for the third Calmed programme. 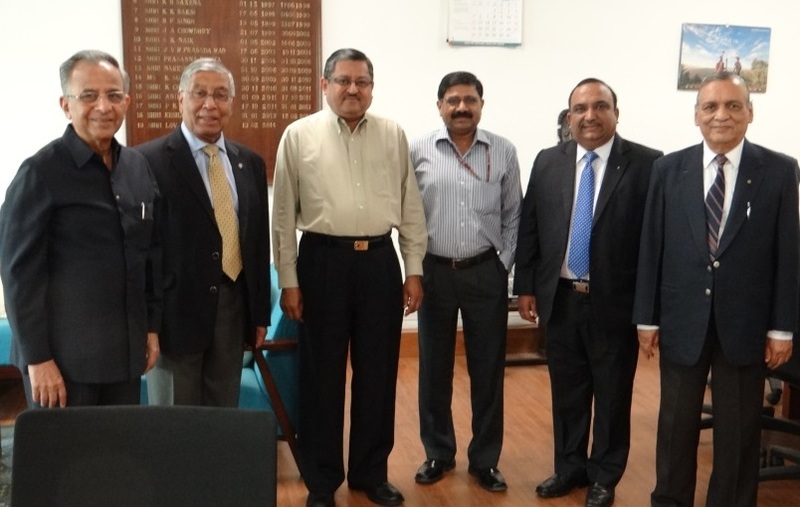 We are also working with India’s government to establish skills trainings and development centres where selected local master trainers (rather than vocational training team members from England) will be responsible for training future master trainers. This will offer a sustainable, realistic local solution to eliminate preventable maternal and new born deaths. We would not have been able to move forward without the constant support, encouragement and stewardship of Rotarians at all levels, from the clubs t to districts , RIBI and RI, including past Rotary International Presidents, Directors, Trustees, and many officers (past and present). Our collaborators remain fully supportive. It has taken more than 50 years of searching, but I am glad I have found the answer to why mothers die and more importantly, how we can save mothers and babies from dying or experiencing complications from childbirth. We have found a solution that works. Read more about the Calmed programme and contact me if you would like to support this vocational service effort. Pledge your support now and join the Calmed revolution! Assam in india also has very high mortality of women during childbirth. How can we intervene through rotary. Pls guide. Thank you for reminding me – Assam as a state has a very high maternal and child mortality. Our Rotary programme Calmed can help, but only in partnership with Government .Please send me an email on drhbasumd@gmail.com – so that we can discuss the issues and find a possible solution.